You have done it since you learned to drive. Activate your turn signal, check the side mirror, take a quick glance over your shoulder, and change lanes. You will do most of that as long as you drive a car. But the “check your mirror part” will soon be a matter of checking a screen to see what the exterior camera is seeing. The side mirror’s days are numbered. Gildshire wanted in on the requiem, and Car and Driver obliged to help with the research. Replacing the side mirror with a camera has long been the stuff of concept-cars, but Lexus is going to be the first carmaker in the world to make such gadgetry a mass-produced reality. Lexus’ new Digital Outer Mirror item on the option list debuts on the side of the Lexus ES this October. It will first come available in Japan. unobscured by rain or snow. The image on each of the two five-inch screens visible to the driver can be enhanced for greater detail or a broader view. The enhancement can be achieved manually or automatically, depending on the settings the driver chooses. The screens will also display a blind-spot warning icon and offer a wider peripheral view than today’s traditional mirror. Therein lies the rub, at least for now. Lexus is currently exploring the chance to offer the tech to the North American market, but the rollout will depend on safety regulations that haven’t yet been established. 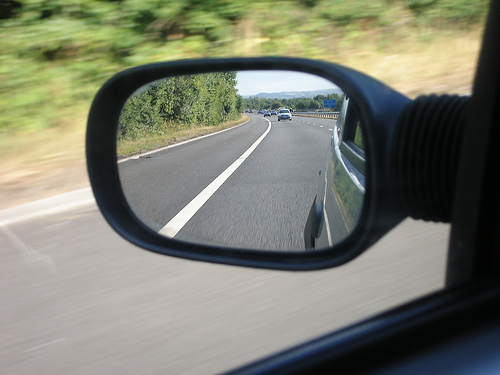 Auto industry observers think the new side mirrors may be available in the U.S. in less than ten years. Gildshire will keep an eye on developments as they arise.